Well, as the name may imply, this seaside town was developed when a new quay was built in the 18th century replacing the name of Towan Blystra, which is now the name of a road in one of the suburban areas. From that humble beginning came what is now one of Britain’s most popular tourist resorts. 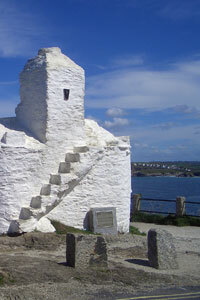 Little remains from before the 19th century here, when Newquay became the destination of choice to the Victorians. There is still some impressive architecture, but sadly it is swamped by less attractive buildings. The town is now far more of a resort than anything else. Packed with nightlife and entertainment, ranging from bustling fun pubs to those that are far more laid back. Just outside of Newquay is the beautiful village of Crantock, full of character and just far enough away to be quiet but not dead. 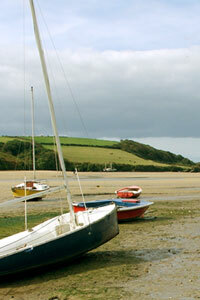 The beach is perfect for families and sits at the mouth of the picturesque Gannel Estuary. In the village itself there are places to eat and drink, nicely placed for those walking back from Crantock Beach's huge, sheltering sand dunes. Its this beach that has added to the village's fame, and those dunes are a great place to loose yourself on a sunny afternoon. Accommodation in Newquay is in abundance. Years of catering for tourists has left the town very well geared up to answer anything a holiday here requires. Hotels, backpackers, self catering, camping and holiday parks; everything you would expect and more. Eating out in Newquay is an experience that is always improving in standard, new restaurants are opening up and making a name for themselves, raising the standard of food immensely. For active and sporty people, there is plenty of entertainment in Newquay. Watersports are in plentiful supply, in sports centres and on the many beaches. There are also riding stables, paintball and a vast amount of surf shops. Trenance is well worth a visit if relaxing in the sun is what you are seeking. The park has grassy areas to lie on, and play equipment for the children; you could even have a game of tennis. But what to do at night? Newquay is well known for its nightlife, with bars numbering into the hundreds, clubs that are open till the early hours, pubs with live entertainment and a great atmosphere. Restaurants too are in there plenty some of which have children’s play areas, all of which have tantalising menus on offer. With this and much more, Newquay is a first choice holiday destination for all the family. In Crantock there is a well known event during the summer, the Bale Push where hundreds of teams compete to, unsurprisingly, push hay bales through the village. The event raises thousands for local charities and is a great spectator sport. The town itself is lined with surf shops, gift shops and bakeries (which sell the national food of Cornwall, the pasty. Like a pie it has meat, veg and potato all wrapped in short crust pastry, you just cannot come to Cornwall without having one!). Most of the shops in Newquay are open until late, so you can walk around the town enjoying the mild and sunny evenings. In and around the town there are supermarkets for you to stock up, if you are self catering, along with fast food outlets and restaurants if you do not feel like cooking. Shopping in Newquay is made more pleasurable by the large pedestrianised shopping centre, always full of life and colour during the summer. All major high street names can be found here, such as Woolworths, along with shops unique to the town. Firstly, in the summer months, when the town is at its best, are those golden, sandy beaches, all eleven of them. They start at Holywell Bay and stretch as far as Watergate Bay - one the biggest beaches in the Newquay area - once there you can learn to surf, kite board, kite buggy, and even wind surf! Also included among these beaches is the world famous Fistral Bay, home to many surf competitions throughout the year including the Rip Curl Championships, recently upgraded to a five star event, and drawing even more high profile surfers. Of course all the beaches have their own facilities such as toilets, food and drink bars and the all-important lifeguards, all of whom are fully trained and always on the lookout. The western beaches consist of; Fistral Beach, nearly a mile long, but very crowded during the summer months. S.E. winds are offshore. The north has a good right-hander, with other waves breaking along its length on various banks. Little Fistral is to the south, and when its right, it goes off. The Cribber to the north, breaks into the headland, and is only for the experienced. It needs a big swell and S.E. winds. Crantock is much quieter being less developed, and has a good quality beach break, at its best from low to mid tide. Again, S.E. winds are when it is at its peak, as is Holywell Bay, which has a good to average beach break. At low tide there is a good wave off of a wreck in the middle of the beach. Porth Joke is good when everywhere else is a little too large. It needs a big swell to work well, and is best to visit an hour after high of low tide. There are four town beaches, the Great Western, Tolcarne, the harbour and next to it Towan Beach - very busy as it is the closest to the town, and with little swell. But a S.W. wind can create some fast hollow waves of up to 6 foot, likewise with the Great Western. To the east is Lusty Glaze, a small beach only working when there is a big ground swell at low tide. S.E. to N.E. winds are offshore. Popular with body boarders. 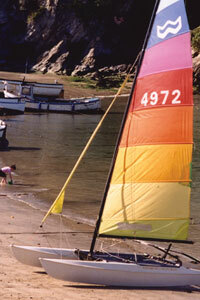 Before you get to Lusty Glaze is Porth, a large, busy beach with plenty of facilities. Watergate Bay picks up any swell, working from high to low tide, and is often cleaner than Fistral. It holds big swell and is best when the wind is S.E. Newquay has a railway and bus stations, both centrally located in the town itself. Outside of the town, about a five to ten minute drive, is the airport. From here there are flights to The Isles of Scily, London, Ireland and locations in the UK and Europe.